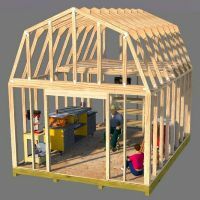 These firewood shed plans will help you build a 2' x 8' firewood storage shed and will require very little building skills. 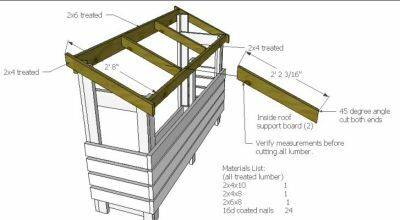 It is constructed entirely of pressure treated lumber. You can however build it with whatever you choose. You can certainly build it with regular dimensional pine and then treat it with wood preservative if you prefer. I've been getting lots of compliments on the piece and am very happy with the way it has been keeping the wood dry while still allowing easy-access. Got your plans the other day for this project. 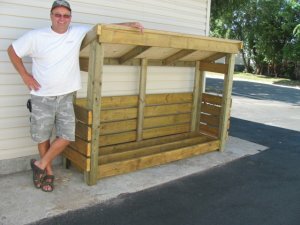 I used my old 2x6 deck boards for most of it. Sanded them down then restained them. Also I used all screws, instead of nails. Could not get cedar planking for the roof where I live. I put 1/2 inch plywood on the roof and then maybe will shingle it or cedar shingles. As this is a gift for my sister and brother-in-law, I will leave that up to them! 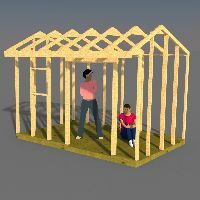 Was fun to build and am presently looking at some of your sheds. 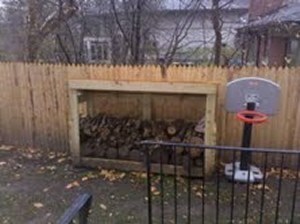 I am not a great carpenter but I want to do more. Thanks, and good job on the plans! You could just build the floor out of pressure treated lumber, and the rest of the structure from regular pine. 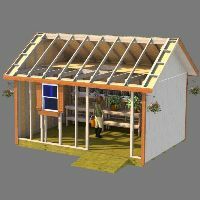 I do however recommend also building the roof from either cedar lap siding or pressure treated 1 x 8's or similar dimension. Right and Left Wall Framing. 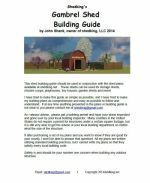 Each building phase has a separate page showing in detail all lumber dimensions, sizes, and cut lengths. 12 pages total comes in a .pdf format file downloadable immediately, securely and safely, through paypal for only $5.95. 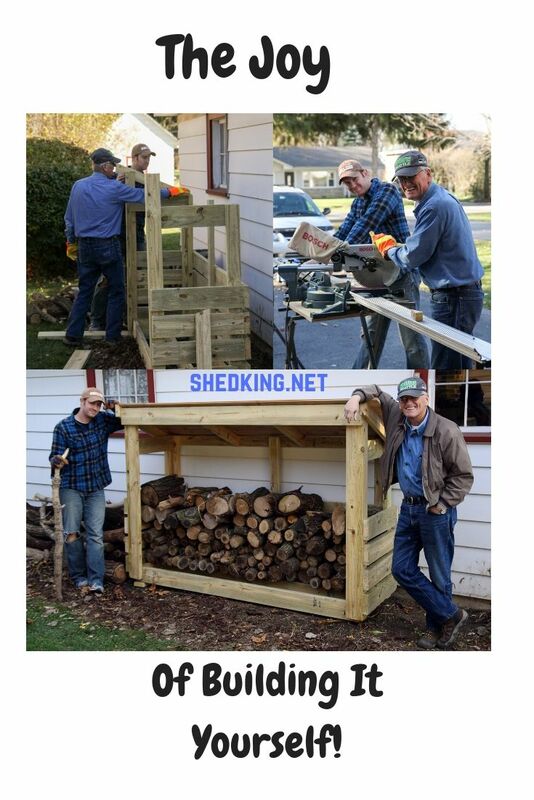 You also get full email support from me, John, the shedmaster at shedking.net. 3d pdf located at the end of the plans that will allow you to zoom in, rotate, hide sections, and more! 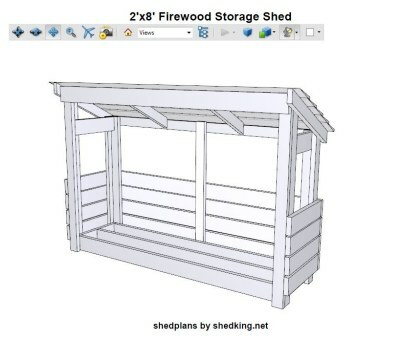 This feature will help you view in 3d detail all the framing of this firewood shed plan. If you aren't sure about a particular construction part in the building of this project this 3d pdf file will allow you to zoom right in on the structure as close as you want. 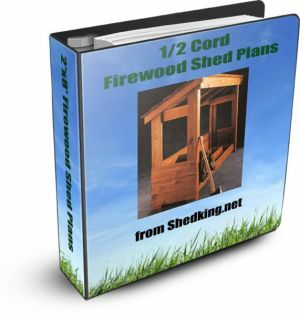 These Firewood Shed Plans are just $5.95 and you can purchase by using the 'Buy Now' button below. Payment is processed by paypal and ejunkie and you do not need a paypal account to make the purchase.